Renowned for its precision timepieces, Omega now has a stunning new Swiss manufacture that’s a marvel of high-tech efficiency and sustainability. Located in the Swiss town of Bienne, it was designed by Pritzker Prize-winning Japanese architect Shigeru Ban, who is renowned for his ecologically focused, East-meets-West approach. Architect Shigeru Ban is famous for using biodegradable materials in his work—notably paper—and has won plaudits for creating recycled cardboard tubular shelters as temporary housing for disaster victims. The Omega factory is structured around a wooden frame built of Swiss spruce with a concrete mould, this format being a signature of Ban. The architect’s most famous buildings include the Aspen Art Museum in the US, the Cardboard Cathedral in New Zealand and the Centre Pompidou-Metz in France. Ban also designed the Swatch Group’s Nicolas G Hayek Centre in the Ginza district of Tokyo, and a new headquarters in Bienne for Swatch. In addition to having been constructed mainly of concrete and sustainable, local Swiss spruce, the building features an energy-efficient indoor climate control system with sun-activated external shading on windows; low-energy, long-life LED lighting with sensors that turn lights off when not in use; roof-mounted solar panels; and a geothermal system using water from wells on site to power heating, cooling, ventilation and lighting. To help keep its watchmakers in optimum physical shape at the new factory, Omega provides employees with state-of-the-art ergonomic workspaces featuring adjustable-height work benches and seating that can be tailored to the individual. A high-tech, ultra-fine air filtration system not only ensures watches are free of dust and other contaminants but also removes airborne viruses. The thousands of visitors who tour Omega’s facilities each year are hermetically separated from the workers in another move to reduce exposure to outside impurities and to avoid distractions to employees concentrating on precision tasks. Previously, Omega’s various watchmaking functions were split across different facilities, but the new factory has enabled almost all operations to be carried out in one place. This decreases the time, energy and resources consumed in transporting components from one location to another (with associated sustainability and efficiency benefits), and allows the company to better track and control the stages of production. After Omega’s sibling companies manufacture individual components and movements, the tasks of watch assembly, fitting of bracelets, packaging and shipping are all now performed under the same roof. The METAS (Swiss Federal Institute of Metrology) certification carried by Omega’s Co-Axial Master Chronometer requires a watch to be subjected to eight separate examinations checking its functionality and accuracy. The 10-day process includes exposure to a powerful magnetic force of 15,000 gauss and other similarly extreme tests that far exceed the parameters of the Contrôle Officiel Suisse des Chronomètres (COSC) certification, strict as it was. To comply with the standards of METAS, Omega was required to devote an independent office in the new factory to the Swiss government, which oversees the impartiality, consistency and precision of the testing. See also: The Omega Seamaster Planet Ocean "Michael Phelps"
Among the most impressive sights at the new Omega factory is the central stock. 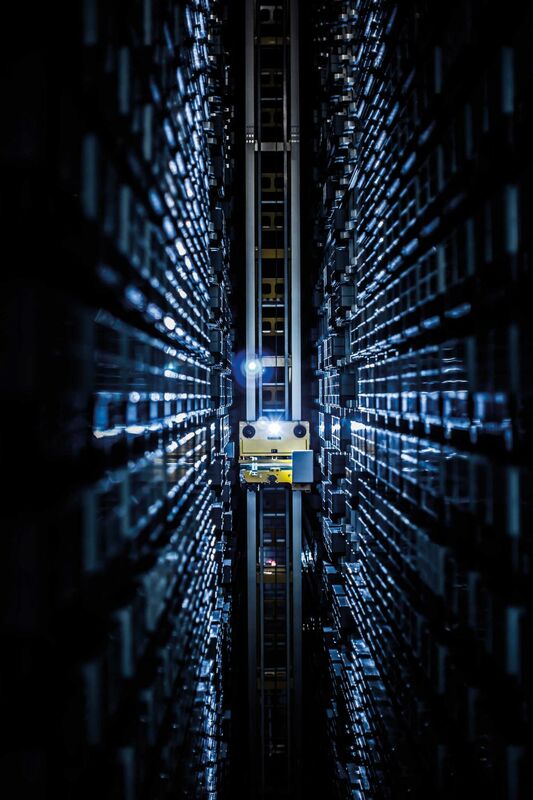 Fifteen metres long, 28 metres high and 10 metres wide, the central stock is a vast, futuristic storehouse that looks like something out of a sci-fi film. Its thousands of shelves contain more than 30,000 grey boxes holding watch movements, hands, dials, straps, buckles, cases, crowns and other components. When a worker orders a part using a tablet on their desk, a robot retrieves the item and delivers it to the appropriate location in less than 120 seconds. In order to protect the valuable components from fire and oxidisation, the oxygen levels in the central stock are kept as low as at the top of 3,000-metre Mont Gelé in the Alps, a level that would cause all but the most seasoned mountaineer to experience altitude sickness—hence the stock’s robotic operation.